Why should you protect your investment? 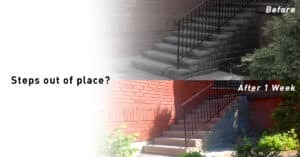 Over time a pisa “block step” system (which is designed to be used when building garden or small retaining walls) will begin to shift out of place. Even the slightest shift will cause water to get through the cracks of the coping and in behind the stones which will wash the base of aggregate away. Aggregate is what supports the structure. The pisa block is a manufactured concrete-based block that will quickly erode when in contact with salt. The end result is shifting stones, safety issues and ultimately a cost to your investment. This can typically happen within 1 year of completing a pisa “block step” project. Don’t let this happen to you. Be aware of contractors who recommend a pisa block system as it has been proven to fail. 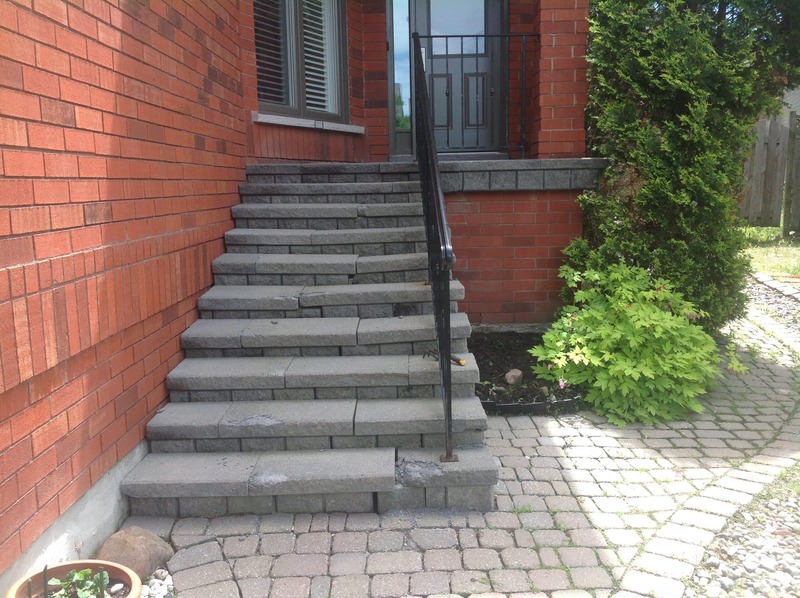 Green Side Up Contracting uses Banas Stones as its trusted provider of natural stone steps. Natural stone will last indefinitely. Banas Stones steps are designed for just that, steps! They are much heavier, much stronger, more durable, slip resistant, and will withstand even the harshest of Canadian winters. 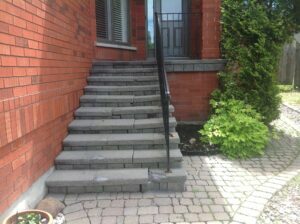 A natural stone step system is a one time investment. The first image is of the pisa “block step” system was initially installed by the owner at a cost of $3,200. 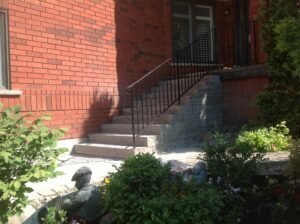 Within 1 year the block “steps” separated and repairs were needed. Year 2 they fell apart, became a safety hazard and needed to be replaced. This is a full natural stone replacement undertaken by Green Side Up using Banas Stones. It was constructed for longevity and was installed at a one-time investment of $8,270. We know the cost was more than the pisa block, however you will never need to replace or repair these steps. When you do the math natural stone steps only make sense. Side by side the difference is extraordinary. The natural stone is level, stronger and will ensure your investment doesn’t require constant upkeep. How long will it take before we start a project? 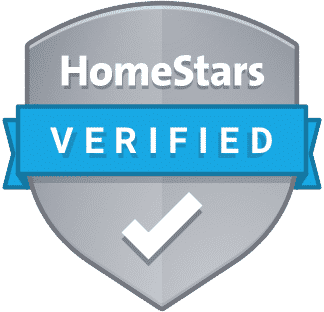 We will make things right for your home. Let us come out to your home and provide a no obligation quote to replace your pisa block project with our natural stone by Banas Stones. Call us or fill out our form and we’ll get back to you within 24 hours.